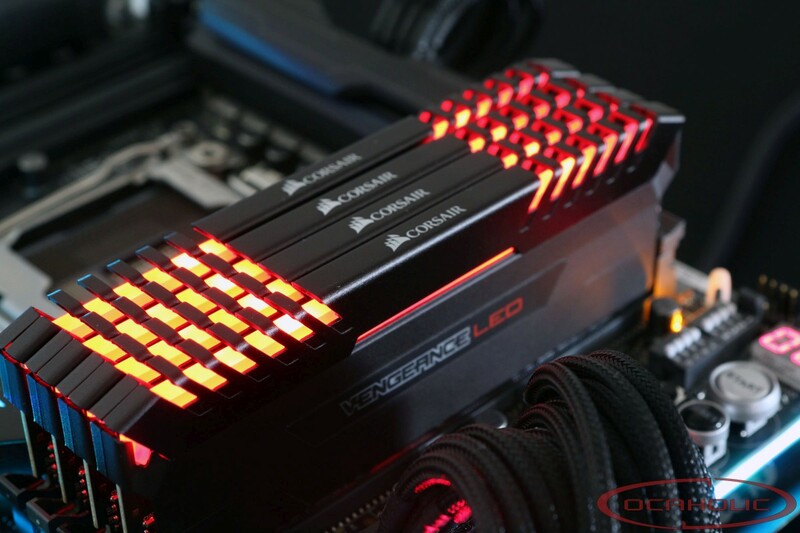 With their Vengeance LED modules Corsair has some good looking DRAM modules on the market. The customer receives a red illumination, which in combination with the black heatspreader, looks rather compelling. Apart from that the specs are interesting as well and DDR4-3200 should definitely pack some punch. With the Vengeance LED DDR4-3200C16 DDR4 kit, Corsair has memory modules in its portfolio, which serve the high-end market. A more detailed look at the specifications shows, that Corsair was cautious in choosing the frequency as well as the timings. The Samsung B-Die chips on these modules are set to run at CL16-18-18-36. If you keep in mind, that other memory makers drive these chips at lower latencies and higher frequencies it's understandable why we're saying Corsair is being cautious. The blunt specs are one thing with these modules, but on the other hand there is the design with the red LED lighting.